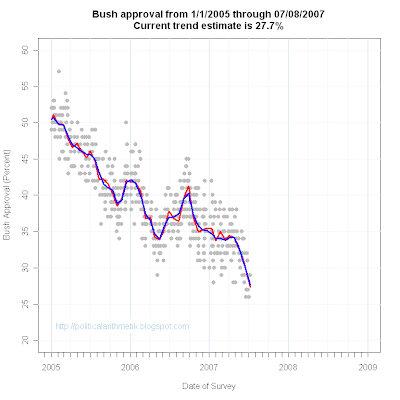 The USAToday/Gallup Poll taken 7/6-8/07 has found approval of President Bush at 29%, disapproval at 66%. This is the first time Gallup has found approval of President Bush below 30%. 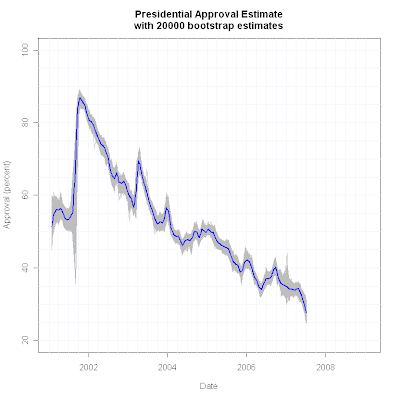 My approval trend estimate now stands at 27.7%. 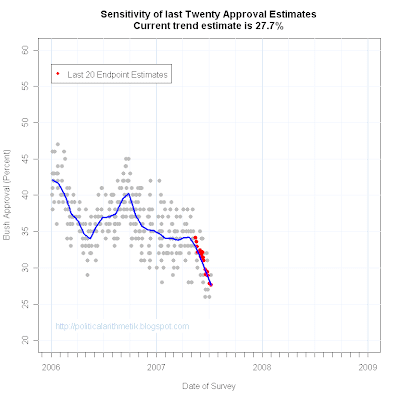 While other polls have fallen into the 20s in recent weeks, Gallup had not done a survey since mid-June. Gallup on average falls 1.26 percentage points above the trend estimate, so the new reading is quite consistent with both the trend and the house effect. 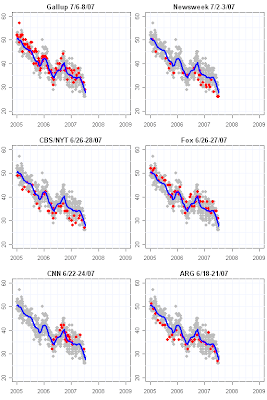 The trend estimate has now held below 30% for the last 7 polls, despite two of those polls coming in at 31% and 32%. Unless something reverses the current downward trend, it is likely that President Bush will see a range of polling over the next couple of weeks ranging from 23% to 33% but with most in the 20s. That is a poisonous level of support for Republicans in Congress, where support for the President's policies has continued to erode. Republican support in the latest poll is at 68%, only the 2nd time Gallup has found Republican support below 70% during the Bush administration. Other indicators in the new poll are also bleak for the White House. A full 66% in the poll say Bush should not have intervened in the Libby case, with 13% saying commutation was the right thing to do, while 6% would have preferred a full pardon. 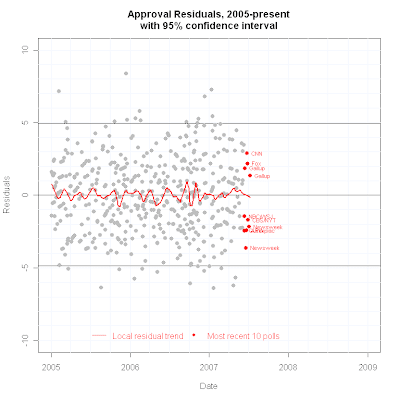 This confirms earlier "instant" polls that found low levels of support for the commutation. And for the first time, over 60% of the sample says that it was a mistake to invade Iraq: 62%. Pres08: Is Anyone Paying Attention? You bet!